Hot cross cannoli, PR-Easter cocktails, Arrosto with Lamb & soft polenta and a special PR-Easter Pizza with pumpkin, gorgonzola and caramelised onion. We love any excuse to feast with family and friends but PR-Easter means we get to feast endlessly on one of our favourite food groups – hot cross buns! This year we’ve taken all the best bun bits and created a hot cross cannoli. We’ll be serving the chocolate shells filled with ricotta, studded with vine fruits, citrus rind and spices in Fitzroy & Prahran until Easter Friday. Our other PR-Easter specials will only be served in Prahran. 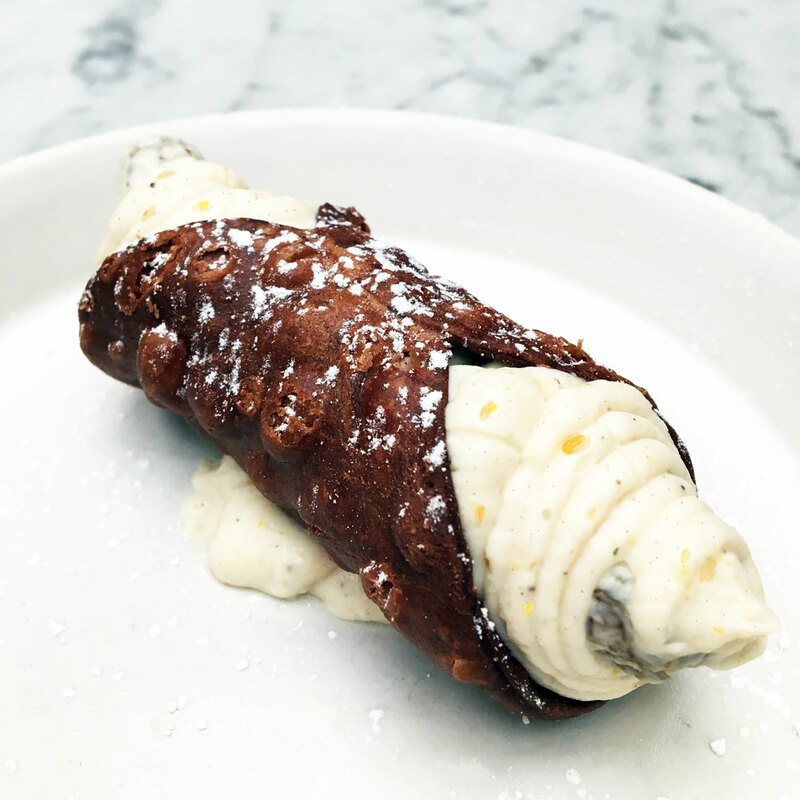 …And if you want to know all about the history of Cannoli check out this link. We challenge you to watch #worldstoughestjob and not feel compelled to give their mama a giant hug! Treat her this Mothers Day… and everyday after! Q: What would you like to do this Mothers Day? We asked our mama’s what their favourite dishes are. Not surprisingly they said: pizza, roast, bubbles and chocolate came up A LOT! So these are the extra special mama loving dishes we are serving alongside our usual menu this Mothers Day. Be sure to make a booking and your mama can enjoy feasting on our mum’s favourite dishes too. $5 a glass, all day Mothers Day. Sopressa, fiore di latte, sugo, fresh basil. Sopressa, fior di latte, sugo, chilli, fresh basil. Spit roasted free range pork, Tuscan slaw, mustard fruits dressing on a brioche bun with extra crackling and rucola insalata. Of course our usual menu will also be available from brunch, lunch and dinner in both Fitzroy and Prahran. We open at 11am on weekends. And the best bit is we will be serving $5 Prosecco all day Mothers Day! Our new $35 Feed Me Menu is perfect for lunchtime functions or sit down dinners. Catering for all dietary requirements so every one can enjoy the feast – gluten free, vegan, dairy free and other dietary needs. It can be adapted to suit stand-up functions within our function spaces, or simply select one of our stand up & cocktail menus. Ladro is ideal for functions and events of all sizes and occasions – intimate gatherings, special celebrations, presentations and launch events. With stunning spaces, marble tables and minimal Italian interiors, our uniquely designed spaces can be a arranged to suit your occasion and styled to create the perfect atmosphere. AV equipment is available including a ceiling mounted projector with built in screen in Prahran, microphones and zoned audio. We love live music and welcome bands and ensembles. 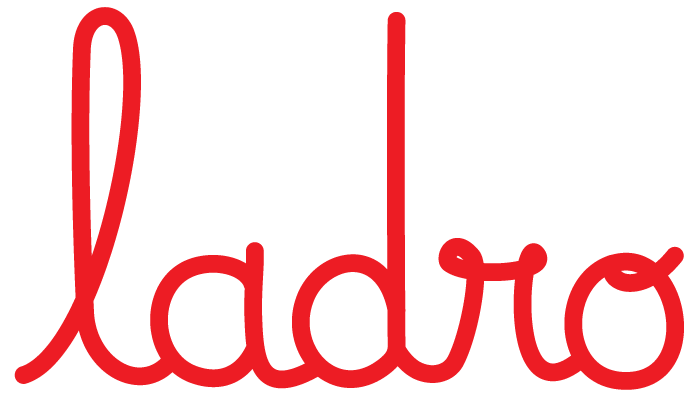 Ladro also has exclusive access to some of the finest music makers Melbourne has to offer. Of course if dancing is a must, we’ll arrange a dance floor to boogie the night away. Our Prahran restaurant has a 24 hour licence so you can dance til you drop! Set the scene with our local award winning florist Flowers Vassette who can create stunning table pieces right through through to ceiling mounted floral arrangements for dramatic effect. Our resident designer can also create stunning greenery or floral pieces when you want a more minimal aesthetic. Let us know your thoughts and we’ll organise a quote. Download our latest functions and events guide here or take a look at our functions page here. 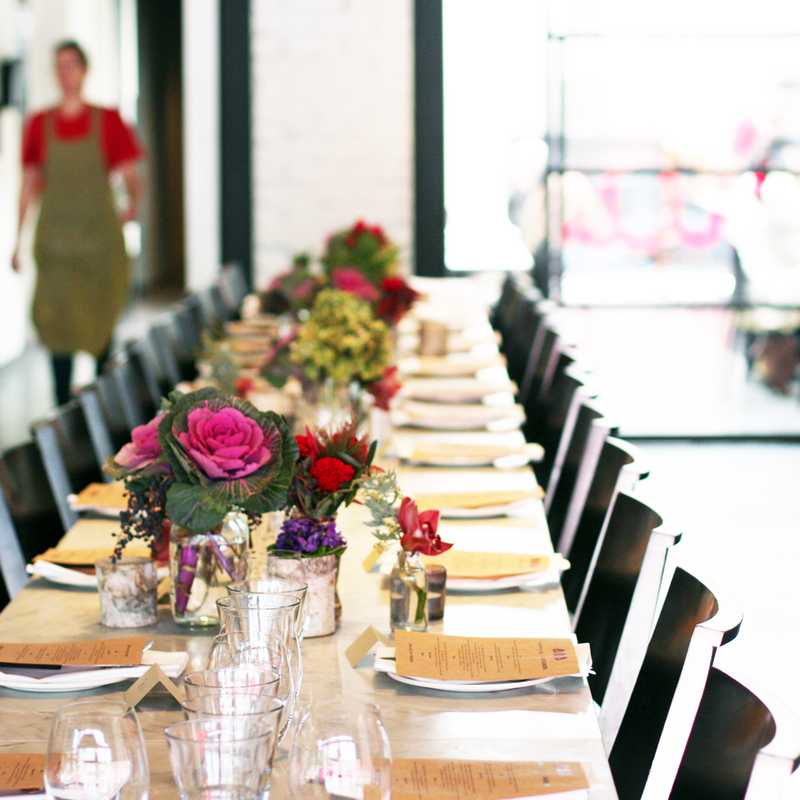 Begin planning your event now with Ladro, we’re just an email or phone call away and we’d love to hear from you. Remember to check out our new ‘Feed Me $35’ Menu! 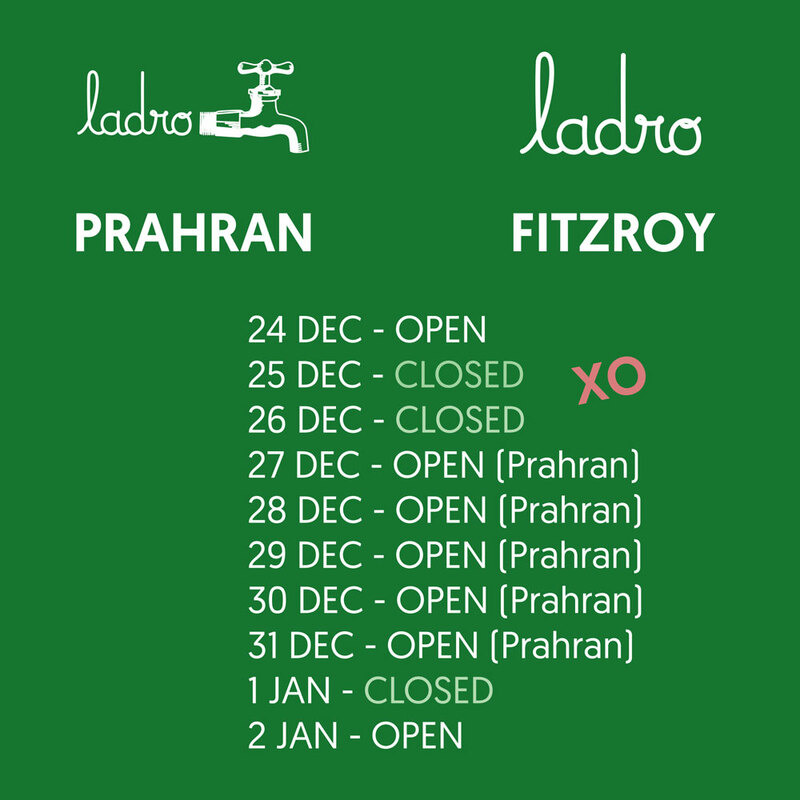 We’re OPEN right through the holiday season in Prahran except for the 3 main public holidays. And we’re only closed from Christmas Day to New Years Day in Fitzroy. Who doesn’t love pizza? Stupid question, of course everyone does. But for some of us, a delicious cheesy pizza is a disaster waiting to happen, for others omitting dairy is simply a lifestyle choice. Now those who can’t eat dairy and those who choose not to, can enjoy feasting on a Ladro pizza without missing out….on the chesse! Ladro has introduced an amazing handmade vegan mozzarella to the menu, available in both Fitzroy and Prahran for your pizza feasting pleasure. Traditional mozzarella is made from buffalo milk and cows milk, hand formed into milky balls of curd – when fresh it’s hard not to eat them like apples! Okay, so vegan mozzarella it’s not made from buffalo or cows milks and doesn’t have that same stringy, stretchy, cheesiness we all love, but we reckon it’s the next best thing to the real deal. Our vegan mozzarella is soy based and melts like real cheese with the consistency of real mozzarella. 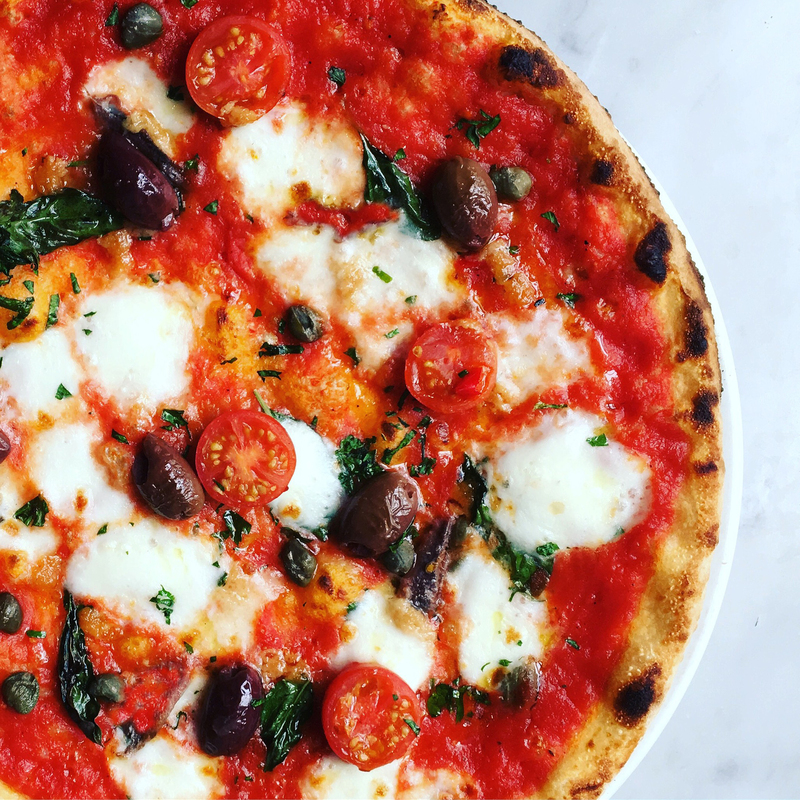 Queen Margherita would be quietly chuffed and happily serve our vegan mozzarella on her namesake pizza. If you want to experiment making your own vegan cheese, take a look at Julie Piatt’s book “This Cheese is Nuts”. Ladro can also offer vegan Feed Me Menus based on our extremely popular Feed Me $45, $55 and $65 per head options. Simply inform us when you book your next function or event at Ladro and we will devise a seasonal menu for your entire group. Our pizza dough is vegan, as long as you are ok with yeast. We don’t use any animal products in preparation of the Ladro pizza dough and embrace traditional slow proving methods develop our award winning Roman style pizzas. 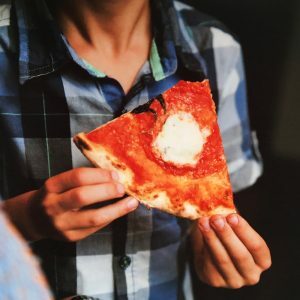 Roman pizzas, unlike their Napoli cousins, are thinner and crispier with an ‘al dente cornicione’, or firm to the bite pizza edge/ crust. We also offer gluten free pizza at Ladro in Fitzroy and Prahran. Our gluten free pizza dough is made in the same traditional method as our conventional pizzas, with yeast and a small amount of extra virgin olive oil, from soya, tapioca, corn and rice flours. We introduced gluten free pizzas 6 years ago at Ladro due to the high incidence of gluten intolerance amongst the Italian population. So if you happen to be a gluten free vegan, we’ve got all the bases covered! 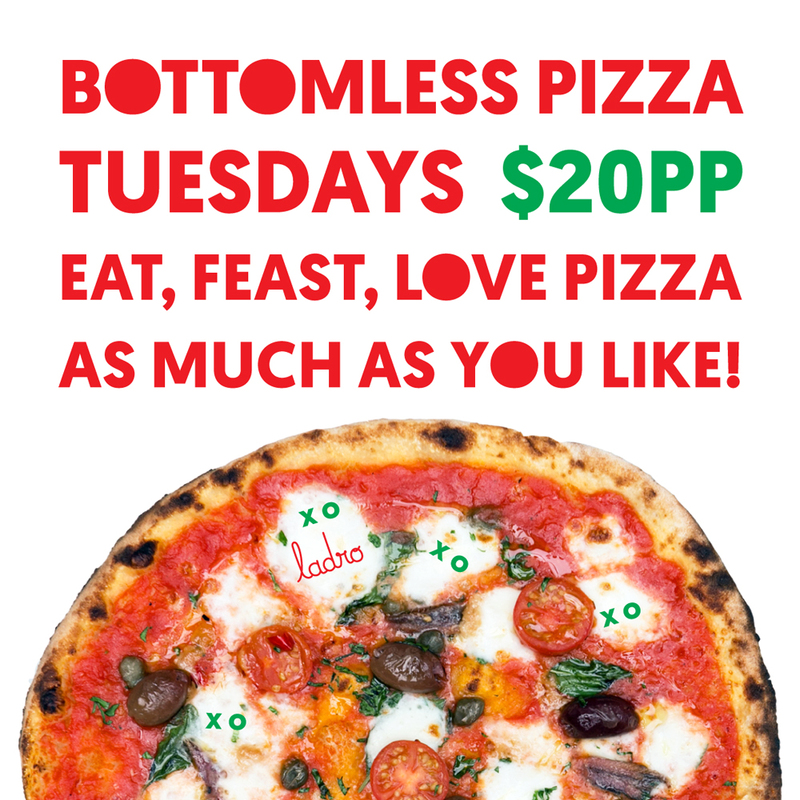 Bottomless Pizza returns in 2018 to Fitzroy and Prahran every Tuesday until Spring! Get on your scooter and hightail to Fitzroy or Prahran to fill your belly with unlimited pizza for $20pp. Feast with a group of friends, your family or roll on in solo. Our 2018 Bottomless Pizza’s are the 4 most popular pizzas we serve at Ladro, so we know you’ll love them. Coincidentally, the top 4 pizzas all happen to have a rossa, or red pizza base. 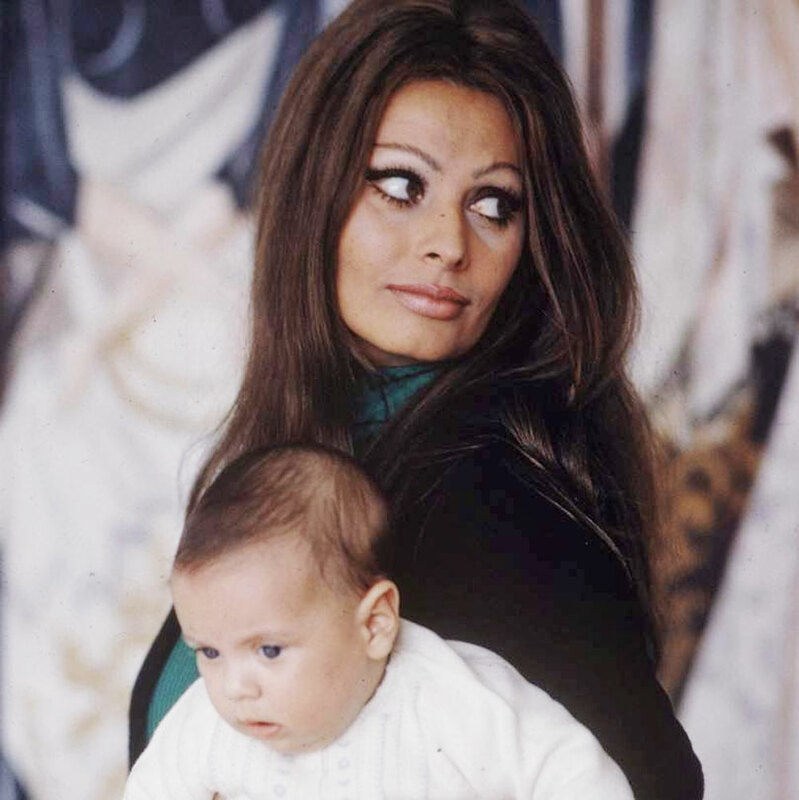 This may have something to do with our outrageously delicious Italian sugo. Or it could just be that rossa pizzas really are better than their bianca counterparts. You be the judge! Ladro loves all of it’s pizzas like children, equally. The first Italian pizzas were actually bianca style flat breads served as a peasant food and made simply with oil, herbs and garlic – tomato sugo, olives and anchovies are said to have been an addition soon after, and eventually cheese was added. In 1889 the Margherita Pizza was born in honour of the queen of the day. Find out more about the origins of pizza here. Feast on the Ladro ‘Mariners Pizza’ which is said to be the original pizza the Fishermen ate upon arrival back to shore and many pizza-files argue this is a tastier pizza than the Margherita. 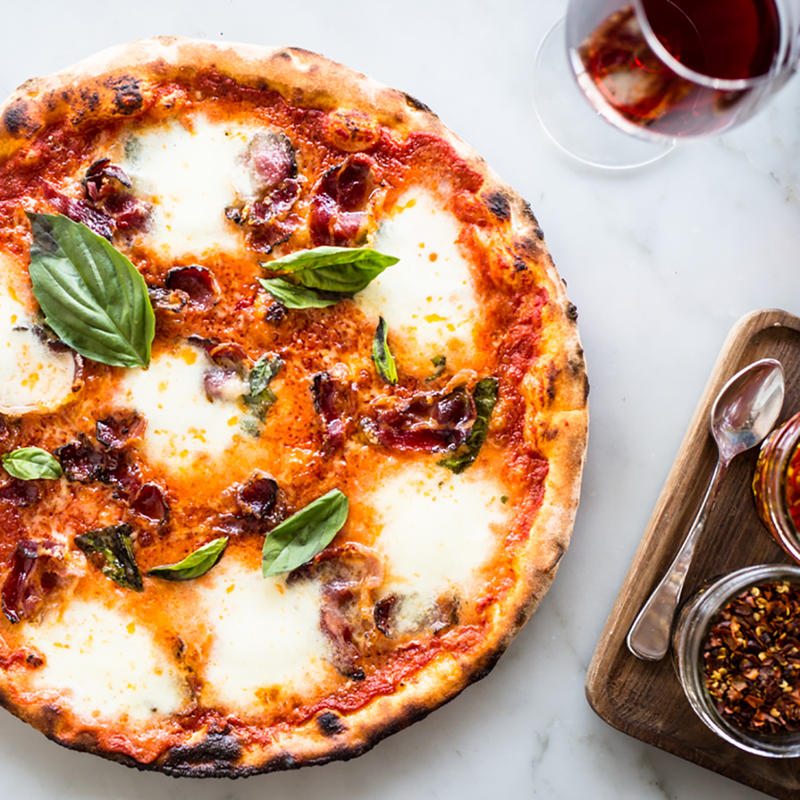 Very few pizzerias actually serve this ancient recipe, but we do at Ladro. Less is more and this is truly one of the tastiest pizzas ever created. If you are ever in Naples, be sure to visit Da Michele where they only serve 2 pizzas. The original Marinara and the traditional Neopolitan Margherita. There is always a very lengthy queue so be sure to arrive early or you could be left salivating, watching the hoards feast on these two misshapen pizzas with envy. 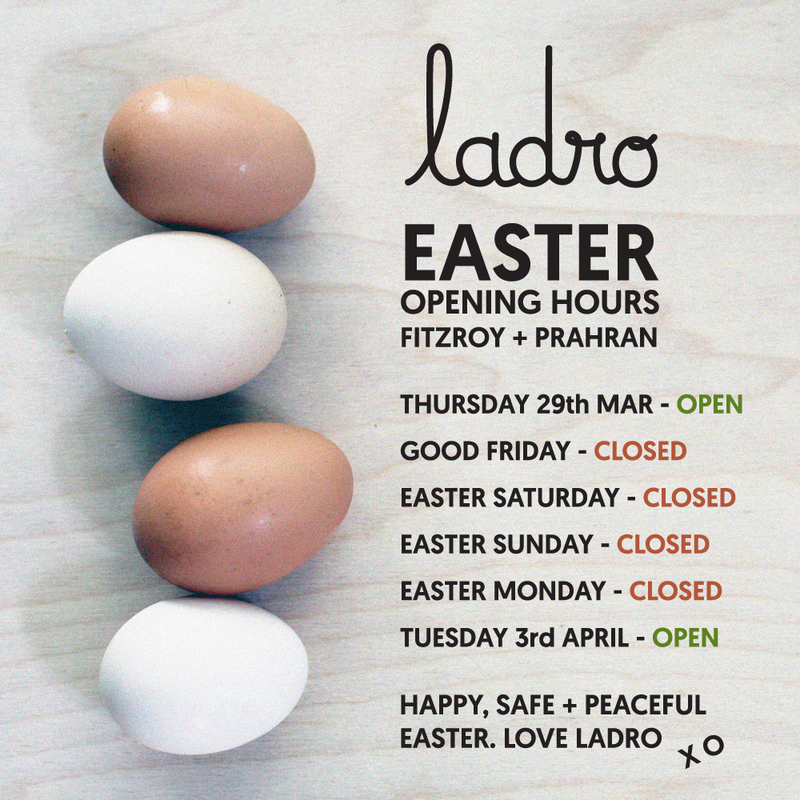 Ladro is open Easter Thursday and Easter Tuesday, but we are closing for the main public holidays from Good Friday to Easter Monday. Everyone at Ladro will be taking some valuable time off to spend feasting with family and friends and we hope you have the opportunity to do the same. May your hot cross buns rise well and feasts be abundant! 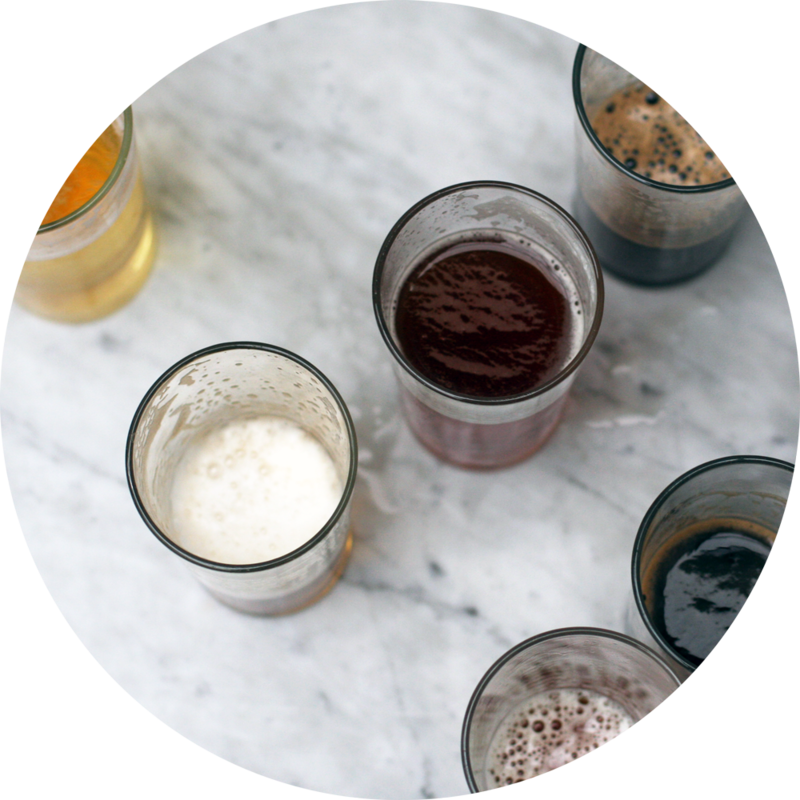 SAMPLE BREW BEERGUSTATION – 8th FEB..
5 x courses matched to 5 x beers $55 pp. Featuring the best brewers in Australia. Part masterclass, part feast and all parts awesome! You’ll get the opportunity to hear from the brewers behind the beers and find out why, what, where and how they brew what they do. Our favourite part is finding out the secret stories behind each beer, up close and personal. Head chef Arron Edwards cooks up a storm matching a dish to every beer. Bookings essential. Salute! We can take care of all your Christmas Function organising, with a menu for every price point. From 2 to 200 guests, in either Fitzroy or Prahran, and a 24 hour licence, we have something for everyone. …Celebrating with family, friends and workmates! Or call or email us and we can answer all your questions.